A North Wales hill farmer is keeping his 16,000 hens happy and laying thanks to underfloor heating from ‘green’ energy stored in the earth. 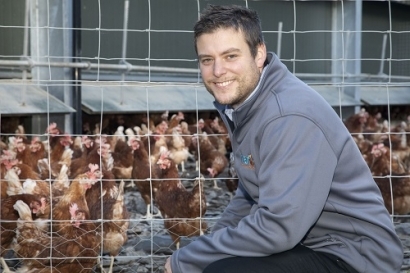 Llyr Jones, who farms 1600 acres 1,000 feet up in the hills near Llanfihangel Glyn Myfyr, is harnessing the power of the ground to keep his hens warm. Under half an acre of grass on which Jones’s sheep now graze at Derwydd Farm, Denbigh-based Hafod Renewables has laid over 2,000 metres of pipe to carry water heated by the soil to warm a giant henhouse to 18C (64.4 F). Snow and ice may grip the surface but four feet down the temperature won’t drop below 4C (39 F) and with the help of a heat exchanger that’s enough to keep the hens at the optimum temperature. David Jones, Managing Director of Hafod Renewables, said, “It’s a 60-kilowatt system which would be big enough to heat five homes and renewables make a lot of sense for farmers. “They have the land for ground-source schemes like this and they have the roof area on their barns and buildings for solar power. their energy to lay larger eggs – if they’re cold then they use that energy to warm themselves up. “When the hens arrive here they’re 16 weeks old and it’s vital that at that crucial stage they are happy and warm so they can put all their energy into growth and laying bigger, better and more eggs." Jones’s hens are free range. Every morning the henhouse doors open and they head off for a day of foraging, returning before night falls to their cozy roosts. Jones is no stranger to innovation – he produces 6,000 bottles a year of Blodyn Aur cold-pressed rapeseed oil and in 2012 updated the hydro-power scheme his father had installed on the Derwedd stream which gives the farm its name. The move into egg production has meant an investment of £600,000 ($782,000) at the farm which stands on the Ruthin to Cerrigydrudion road and not all the production goes to Tesco – there is an honesty box system with a dozen eggs at £2 ($2.61). Hafod Renewables has done plenty of work at farms across North Wales – over 100 of them, mainly dairy producers, have had solar systems installed but this was the first system they have put in for a henhouse. Hafod Renewables now employs nine staff and with a turnover of over £1.5 million ($1.96 million) has become a key player in the region in the installation of solar and non-solar systems such as air and ground-source heating and biomass.